I recently read this article about making up fasts from Productive Muslim. I’ve been meaning to start making up my missed fasts and although I’m a bit late of the mark, starting now is better than not starting at all. 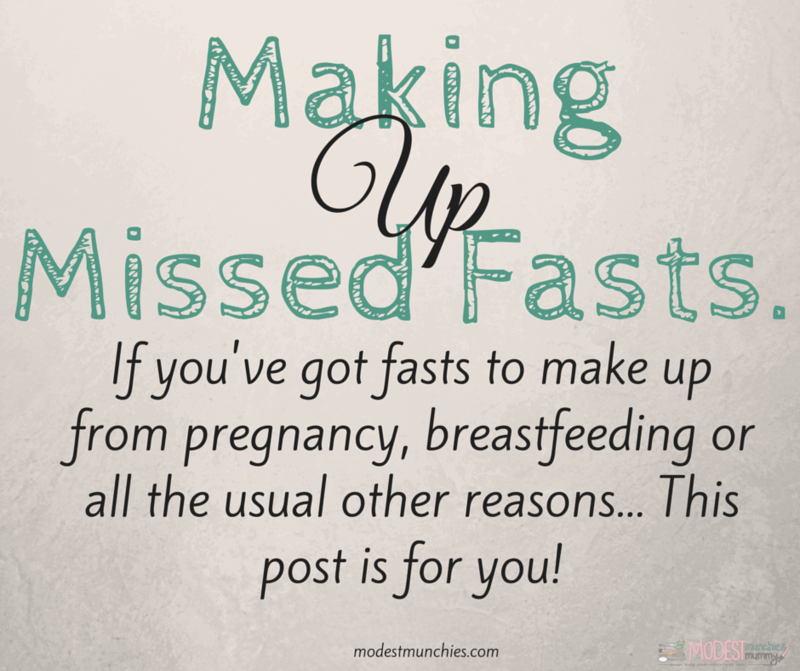 I’ve missed fasts in previous years from being pregnant, breastfeeding and of course the usual missed fasts. While I make up a few each year, I never push myself hard enough and it’s always easy to forget until Ramadan rolls around again. We have just over a month before Ramadan and I’d like to make up as many as I can, I have 44. I know I won’t get close to finishing them all but I’d be happy if I knock off at least 10, if not more. 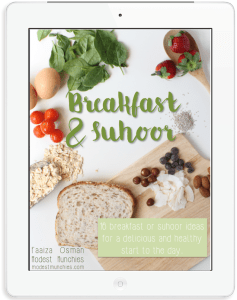 My goal is to make at least the Sunnah fasts each week and then throw in a few others where I can manage. I know there is a difference of opinion in regards to whether certain fasts are meant to be made up or paid the fidyah for. I recommend you discuss this with an Imam or learned scholar. 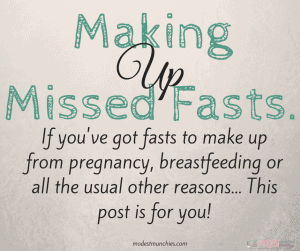 From my knowledge the consensus is that pregnancy and breastfeeding fasts are meant to be made up as they are a temporary state, based on this I plan to make up all my missed fasts, even though they may be many in number. Again, please seek advice in regards to this matter. We’re about to hit Winter here in Australia, so our days are short, a mere 12 hours of daylight. A perfect time to start making up fasts and I plan to continue after Ramadan as well. By posting it here quite publicly my hope is that it can help me stay on track and serve as the motivation I need. I know you may not all be in the same boat, and many of you reading this are in the throws of Summer with long hot days, babies and busyness but make a start, even if it’s just a few, it will good practise for Ramadan as well. Whether you’ve got as many fasts as I do to make up (or more) from pregnancy, breastfeeding, from menstruation, sickness and general forgetfulness, just remember you can do it! Set your mind to it, set a goal and In Sha Allah you can knock them off. If you’d like to join me on this journey, I have a few things that might help us along the way. I’ve started a Facebook group for support and motivation as well as some free printable trackers. 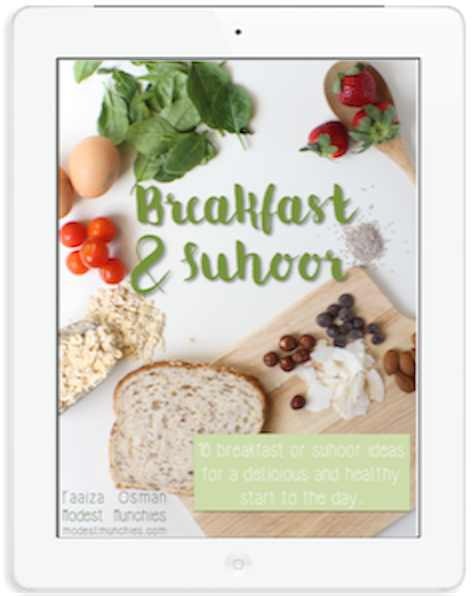 If you’re joining me in the Facebook group I want you to get in there and tell everyone how many fasts you have left to make up (if you’re comfortable with sharing) and also set a goal of the number of fasts you want to complete before Ramadan. Keep the goal small and achievable. Hopefully, this will give you the support and encouragement you need to get started. If you’re a social media junkie and plan to post your suhoors, iftars or just anything in general related to this, feel free to use the hashtag #missedfastsclub. It will help us check in with each other as well as keep you motivated to keep going, in sha Allah. I commissioned my cousin-in-law Aysha of Penny Paperoni to create these beautiful printables, these are yours to download for FREE. 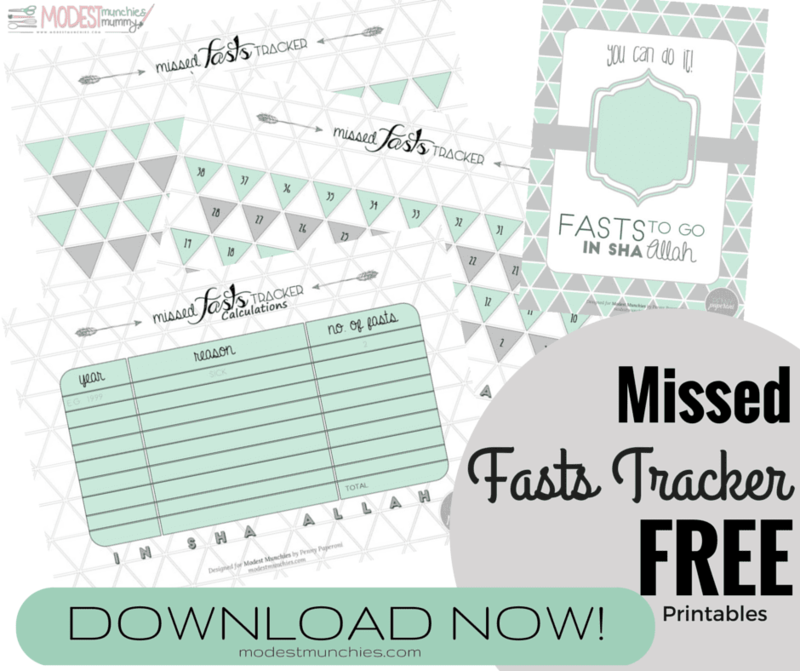 The printables include a Missed Fasts Tracker, a Missed Fasts calculation sheet and a Fasts Left print. You can easily download and print these with a single click at the end of this post. The printables are pretty clear, but I’ve included a little explanation of how to use each one at the end of the post. 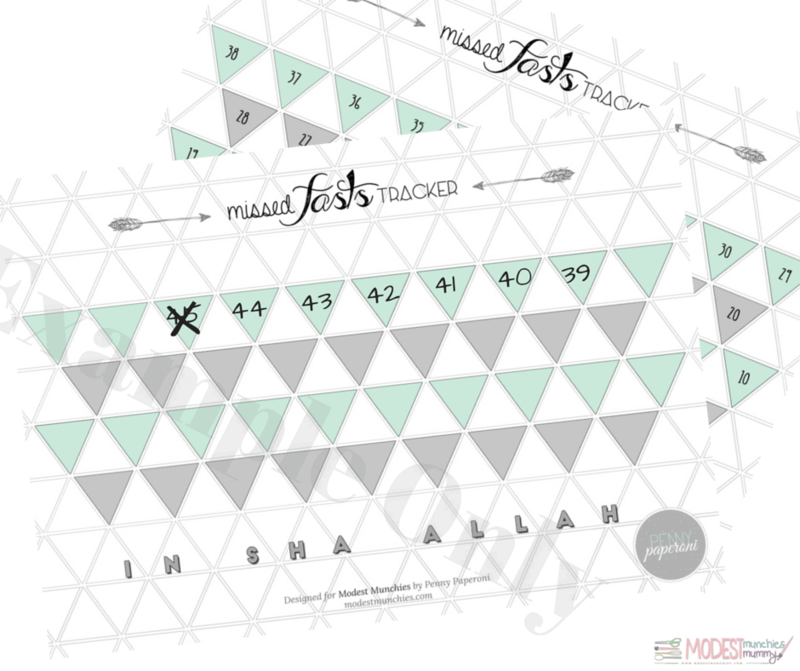 Missed Fasts Tracker – Calculations – this sheet is an ideal place to jot down and calculate your missed fasts over the year. Consider each year you have had missed fasts and all the reasons you would have missed them, then give each reason an approximate number. Don’t forget to tally it at the end. This reason and set out of this sheet was inspired by the post on Productive Muslim I mentioned earlier. Missed Fasts Tracker- the sheet gives slots for 38 fasts, I know not everyone has the same number of fasts but this seemed like an ideal number as a starting point (plus it fitted best on the page ;)). If you have less than 38 just scratch out the extras and use it from the number you need. Or make the blank sheet with your ideal number. If you have 38 fasts, awesome, you’re good to go. If you have more than 38 fasts, print out the sheet as well as a blank sheet and mark the extra numbers you require. 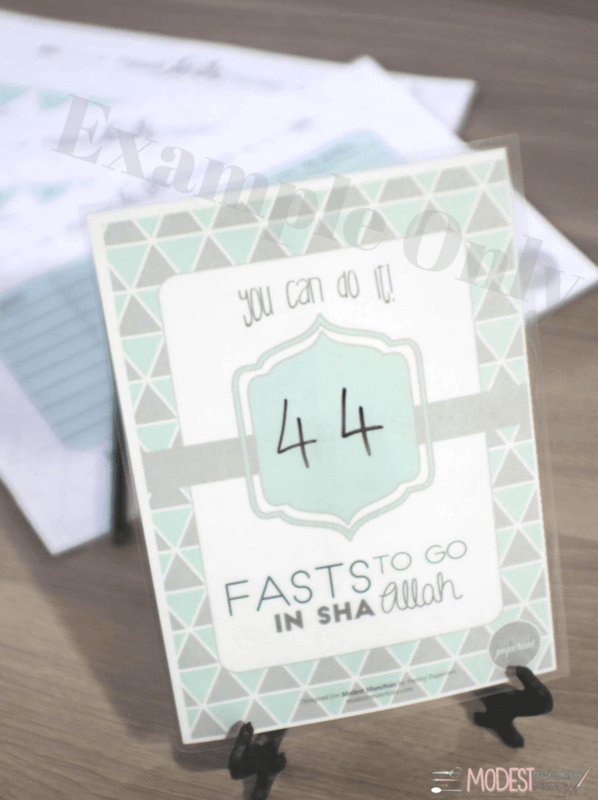 You can do it _ Fasts left in sha Allah – this sheet makes such a cute printable to have on display (you may want to display it somewhere private though). Place it in a cute frame or laminate it and put it on a stand, use a dry erase marker to write in your number. Penny Paperoni is launching soon, I’ll be sure to share all the details with you as soon as I have them. The printables are just beautiful so I know there’ll be more gorgeous prints coming our way. Such perfect timing! With Ramadan approaching I was lamenting the fact that I have so many days to make up and was wishing there was an app to keep track! This is great, thank you! I’m so glad you found this beneficial. I hope the printables work for you! What a great idea, mashallah! Just what I need to keep me motivated to make up the missed fasts. Thank you for these great printables and the motivation! You are most welcome. I’m glad so many can benefit from it in shaa Allah. Subhaan Allah! Perfect timing! May Almighty Allah richly reward you, Ameen! Alhamdulillah ive decided that this year my goal is to knock off those qhada fast so this is what i needed. Alhamdulillah I’m at the moment busy with mine and I was looking for something on the internet for a way to keep track. Excellent idea!!!! Thank you. Hope it helps 🙂 It’s so nice having a visual way to keep track, isn’t it?! So wonderful to know that I’m not slone in this struggle. Thank you for this post.